November 16, 2017 – AccuWeather reports as millions of Thanksgiving travelers plan to travel by plane or driving, quick-hitting storms will cause slowdowns across different regions of the United States. Nearly 51 million Americans will travel more than 50 miles away from home for Thanksgiving, according to the American Automobile Association (AAA). This represents a small increase from 2016. New information suggests the weather pattern is much less likely to lock into a cold and stormy pattern through the Thanksgiving weekend across the Northern states. Meanwhile, multiple days of unsettled conditions may evolve in the Deep South. With this more progressive idea, there will still be blasts of chilly air and rounds of lake-effect snow. However, cold outbreaks will be limited to a couple of days and storms will tend to be weaker and swept along by the fast flow of air. 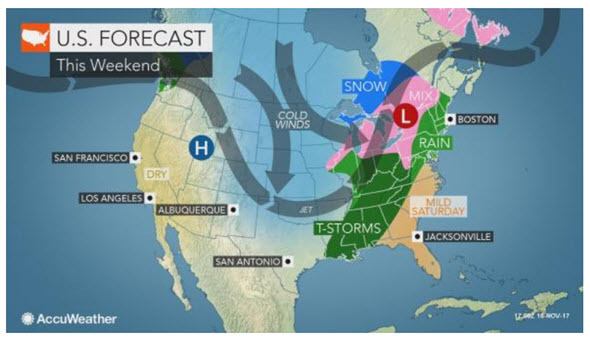 As Thanksgiving travel ramps up, one storm will sweep across the nation from Friday to Sunday. Spotty rain and snow will affect the central and northern Rockies on Friday. On Friday night and Saturday, drenching rain and locally heavy thunderstorms are forecast from the middle Mississippi Valley to the lower Great Lakes region. Motorists may have to slow their commute and rely heavily on their windshield wipers. Airline passengers from St. Louis to Nashville, Cincinnati, Cleveland and Pittsburgh may face some turbulence and delays. The same storm will race across the Eastern states from Saturday night to Sunday. Over the Appalachians and in the coastal mid-Atlantic and New England, several hours of rain are in store. There may be a rumble of thunder. People catching flights Saturday night to Sunday morning from Washington, D.C., to New York City and Boston may experience some delays. In parts of the Appalachians, the rain may end as a brief period of snow. East of the Appalachians in the South, a singular gusty shower may mark the arrival of the chilly air in lieu of long-lasting rain during Saturday night. Colder air sweeping in behind this storm will cause lake-effect snow to break out from west to east this weekend. Areas over northern Michigan will get hit first on Friday night and Saturday. 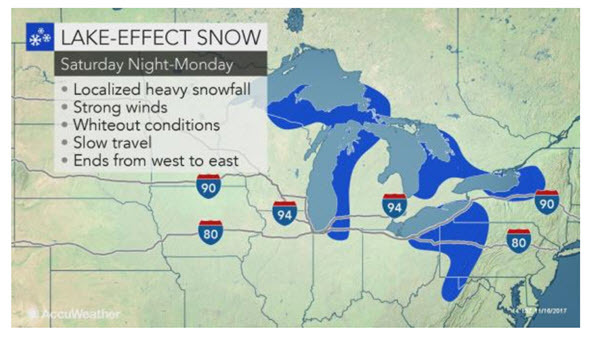 Meanwhile, bands of heavy snow and snow squalls will hit parts of western and northern New York, western Pennsylvania and northeastern Ohio by Sunday. While an excessive amount of snow is unlikely, several inches to a foot of snow are possible with the greatest risk to motorists on highway such as Interstates 75, 79, 80, 81, 90 and 196 being sudden changes in visibility and icy conditions. Gusty winds will force motorists to keep a firm grip on the steering wheel in the Upper Midwest and Northeast this weekend and could add to airline delays at some airports. Aside from retreating lake-effect snowfall immediately downwind of lakes Erie and Ontario, much of the nation is projected to be free of rain and snow from Sunday to Tuesday. These three days may offer the best travel conditions on the ground and in the air due to calmer weather conditions predicted across much of the country. The only major exception will be the approach of a new storm from the Pacific that will spread some rain and high country snow into the Northwest. Seattle will be the major airport most affected by the new storm on Sunday. The rain will shift southward into San Francisco during Sunday night and Monday morning. Some mountain snow may settle across the upper part of the Great Basin and northern Rockies by Tuesday. Spotty rain showers will be more of a nuisance in Houston and perhaps Orlando during the first part of next week. 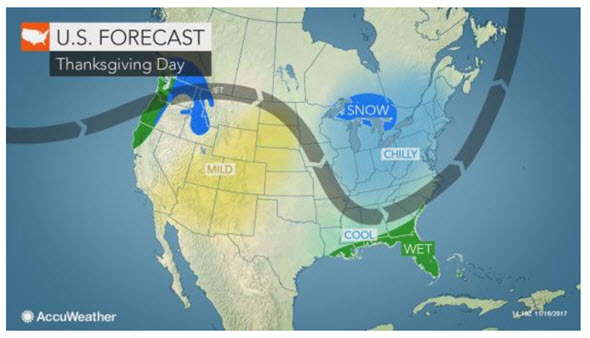 On Tuesday, another burst of chilly air will emerge over the North Central states, this will kick up winds and is likely to initiate a new pulse of lake-effect snow over the Upper Midwest but north of the major hubs of Chicago and Detroit. Wet weather may be in store for portions of the mid-Atlantic and New England coasts by Tuesday night, should a batch of rain be pulled in from the Atlantic. During the middle part of next week, moisture is likely to gather around the Gulf of Mexico as a storm slowly brews. Rainfall associated with this storm is forecast to expand northward and eastward but only to a certain point in the Southern states. At this time, areas near the I-10 corridor are most likely to turn damp and unsettled on Wednesday. The wet weather may linger through Thanksgiving Day. Meanwhile, another storm is forecast to roll ashore in the Northwest on Wednesday and spread inland on Thanksgiving Day. While the potency of this storm is still in question, there is the potential for substantial rain-related travel delays with the storm along the I-5 corridor from Washington to northernmost California, as well as the risk of lowering snow levels over Snoqualmie Pass along I-90 in Washington. 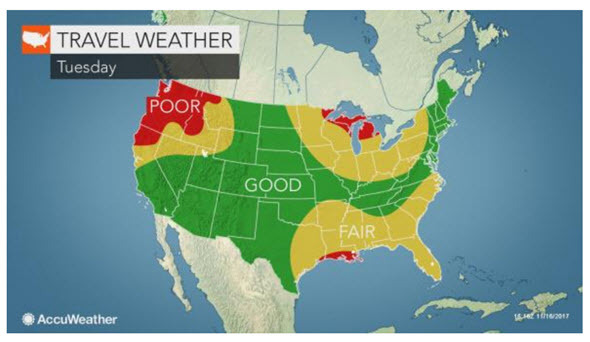 AccuWeather will continue to provide updates on the Thanksgiving travel weather forecast through the holiday weekend.